The 2015 Anti Internment League’s (AIL) march against internment took place in north Belfast at 2:30 pm on Sunday 9 August to oppose “the unjust imprisonment of Republicans via internment by remand, revocation of license and miscarriage of justice to stand as one in opposition to this British policy in Ireland”. This year’s march only managed to travel 500 metres from Ardoyne Avenue to the junction of Old Park Road and Rosapenna Street. 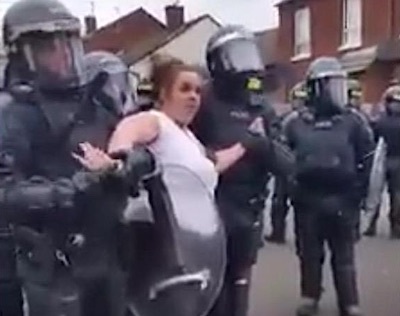 It was at this point that it was stopped by a cordon of PSNI (Police Service of Northern Ireland), in space-age riot gear, armed with shields, batons and guns standing between a line of heavily fortified land rovers. This line was backed up by several other PSNI land rovers to the rear and at least one water canon truck. This years march brings to light that a two tier system of policing and justice may well be in place in the north of Ireland. This AIL parade was to be the only republican parade of the year to march through Belfast yet it was still refused full permission by the Parades Commission (PC). Each year and several times per year, Orange Order (OO) parades march through the city centre while violating the PC conditions they march and in a sectarian manner. Furthermore, as witnessed at the recent 12th July march in Ardoyne, a member of the OO attempted to murder his republican neighbours by driving a car into a crowd of on-lookers. He injured two, hospitalizing a teenage girl in the process. He was released on bail soon after being arrested and going to court. Contrast that with the imprisonment of Irish Republicans, for months and sometimes years on end, with no court appearance and based simply on the word of a police officer. This is a mere snapshot of how justice and policing is administered in the north of Ireland. The Parades Commission (PC) ruling that this march would be blocked unless it was in and out of Belfast city centre by 1:30pm was an impossible task. Especially when organisers had already decided to begin at 2:30pm. Hence the march was blocked. So why would they not just march at 1:30 and have done with it? The march would have gone ahead, with full PSNI protection, and for the second year in a row Republicans would have marched through Belfast city centre. This would demonstrate a gathering of momentum. The parade goes through again next year and the year after that and could eventually lead to the climate being as it should always have been - loyalists respecting the right of their Republican and Catholic neighbours to march in their own city. But march organisers claim they had already accommodated the PC by moving the march from a busy shopping Saturday to a quieter Sunday. They also moved the time of their march to 2:30 to accommodate the Ballymurphy Massacre march taking place in Belfast that day. Republicans may indeed argue that the need for this parade is based on the fact that they already move too much. Therefore asking the PC to accommodate their 2:30 start would not be unreasonable. As this journalist witnessed, this march was a peaceful march. Furthermore the marchers have no history of violence on such marches and it was billed as a ‘human rights march’ by organisers. In fact, on more than one occasion, the marchers have been subject to attack and abuse from British loyalist groups who have targeted the march in the past. The AIL believe that since internment was officially reintroduced in Ireland in 1971 (as it had been in de facto use since at least the 1920s), that it has never been fully revoked. While internment in Ireland today may not be as brutal or obvious as it was in the 1970s, like the ‘The Hooded Men’ - they claim it still exists through use of remand, revocation of license and miscarriage of justice. The AIL are Irish Republicans who oppose the Good Friday Agreement (GFA), follow on agreements to the GFA and the British presence in Ireland. Internment was reintroduced by the British in August 1971 in Ireland to arrest and imprison, without trial, anyone they believed to be in the IRA. In fact very few of those arrested were members of the IRA. Internment served only to harass and persecute the Republican community and swell the numbers of the IRA. Today, the AIL believe, that both the British and Irish administrations in Ireland are implementing internment by remanding Republican activists in prison on spurious charges. Republicans are later freed, without any charge, but with severe limitations placed upon their freedom. These restrictions include, prohibiting them from speaking to the media or expressing their opinions publicly. Republican activists believe the intention is to remove them from the political sphere and to weaken republican activism and protest against the Good Friday Agreement and British institutions in the north of Ireland. Stephen Murney and Dee Fennell are recent examples but the list is much longer. Additionally, Republicans have been interned through the revocation of their license, which granted their release from prison under the Good Friday Agreement. Revocation of this license returns them to prison. One such case was that of Marian Price, even though she had never been released on license but on royal pardon. Martin Corey is another such example. It is on this basis that Irish republicans march against what they perceive as internment. They do so as close to 9 August as possible, to commemorate the date the British government reintroduced internment without trial in Ireland in 1971. Jailed for the killing of PSNI Constable Stephen Carroll in March 2009, campaigners believe the evidence against them is flimsy and their imprisonment unjust. And despite the continued concerns about the conviction of the Craigavon Two - Fresh Concerns for the Craigavon Two - they remain on the inside. These are the main reasons the AIL believe internment is still being used as a tool by the British authorities in Ireland against those who oppose their presence. These points were raised again at this years march as they had been at previous marches. In recent years, the 2013 AIL march was marred by British loyalist violence and was re-routed as a result. The 2014 rally was relatively peaceful yet it was still attacked by British Loyalist protestors as it passed through Royal Avenue in Belfast city centre. The PSNI, again in full riot gear, stood and watched Republican marchers while standing with their backs to the loyalist mob on Royal Avenue, that threw missiles, bangers and other projectiles at the marchers. The PSNI made no attempt to tackle loyalist protestors or prevent them from attacking the passing republican parade. Again a two-tier approach in operation. When this years march was blocked by Robocop styled PSNI riot squad there were already countless PSNI land rovers policing the area before, during and surprisingly afterwards. What was also surprising was the shut down of Belfast city centre. As my taxi driver said “it’s like the 70s in the city centre”. Notwithstanding the heavy and semi militarised police presence the parade was peaceful. Organisers had called for this beforehand and had asked those with non-peaceful intentions to stay well away. Organisers even removed one of their marchers, holding the Irish tricolour, who had made his way onto the bonnet of a PSNI land rover in the police cordon. Once marchers arrived at the police cordon, the announcement came over the loudspeakers, as was posted on police signage, that the march could proceed no further. This met with chants and boos from the crowd but this was to be the height of the disturbances. Shortly afterwards speeches were made by one of the organisers and a Donegal Councillor, Micheal Colm Mac Giolla Easbuig, from the Gaeltacht region in Donegal. Immediately after these speeches one of the organisers announced that this was the end of the march and they would now be dispersing. He asked that everybody do so peacefully. Everybody followed suit. Shortly afterwards I noticed, as I conducted my final interview after the march, that an eerie silence descended as all participants had dispersed. We were one of the last people left in the area. After this interview we went on our way and walked for about 10-15 minutes before getting into a car to leave. We drove around for some time, as most roads were blocked with traffic leaving Ardoyne, so we had to return to Old Park Road to get to the Falls Road, where I had parked my car. It was now at least one hour since the march had ended and some time had passed since everybody left the Old Park Road/Rosapenna Street junction. It is therefore surprising that the police still remained. The bands and marchers had long since dispersed so their presence was no longer required. Why did the police remain there for so long after the march had ended and people had dispersed? Why were they still so heavily armed? Did this in any way contribute to provoking a response from local youths? When I returned to the Old Park Road area at that time I witnessed some stone and missile throwing at the police which, by Belfast standards, was hardly noteworthy. What was noteworthy was the heavy police presence, the armory they carried and the deployment of a water cannon truck. I could see little justification for such a presence, particularly as everybody had left at that time. Contrast that scene with the scene, 5 minutes away, at the Twaddle interface. A mere handful of police stood without riot helmets, shields or batons in front of the loyalist mob gathered there. However, Police land rovers swooped into the Twaddell area as they noticed that the Republican marchers were heading towards the shops opposite Twaddell. The shops area is in a predominantly republican area. Land rovers swooped in to prevent marchers marching in their own area and on their own streets and little or no police presence to block loyalists. Again two tier. It needs to be remembered that roughly 60% of all parades held in the north of Ireland are OO or OO related. The vast majority of these are contentious yet still they march through city centres and through catholic and republican neighbourhoods. Little is done about their PC breaches - Parades Commission report 2012 and flash points such as Drumcree and Twaddell are still tolerated. Everybody has a right to march through their own city centre and through their own neighbourhoods. As I witnessed at yesterday’s Anti-Internment march, the police presence at that time was unwarranted and could have been provocative. A pregnant woman was manhandled in the most brutal fashion into the back of a police land rover and the city was put into a military styled shut down. While not as brutal as in the past, it would appear as if a two tier police and justice system - one rule for Irish Republicans and another, much more lenient one, for the pro British community - is in force today in the north of Ireland. And this time it has the approval of certain Republican parties.